How can we live so close to something and not see it? In February 2007 our neighborhood gathered to watch Al Gore’s video An Inconvenient Truth. I watched with hedging concern. Yes, we were taking steps to live with less impact. But how in the world could we make a real difference? A friend and neighbor who brought us the film, Dave Frazer, suggested we try a course designed for communities and neighborhoods. It looked like a great excuse for potlucks! We got hooked. Over the next 3-1/2 years we journeyed together through the discoveries found in the NWEI courses. New faces came and went but 8 or so people stayed through the whole series (of NWEI discussion courses). We changed shampoos and lifestyles. We started with the course, Discovering a Sense of Place, and everything that came after that continued to bring our dialog back to our homes, families, neighborhood and community. This is not to say our ideas always aligned. I admit to fantasizing about relocating everyone in our living room to a community of our own. Fortunately those with greater sensibilities reminded me the real changes can, and should, be made right here… right where we were. And right where we were turned out to be in close proximity to a magnificent 64-acre urban forest. One neighborhood group fought off development of the forest for 10 years and successfully agitated for a purchase grant, but didn’t have the required matching funds to use it. Many of us had helped out in small ways but it became a delaying effort and would have been ultimately fruitless had the housing market not crashed. But it did, and we saw an opportunity. We founded a new organization called Friends of North Creek Forest. FNCF agreed that any conservation solution must be a victory for our whole community including landowners, the city and our obvious but overlooked allies: educators and tribal interests. By taking the time to reach out to each potential partner we began to see their concerns and address them. The city, like most, is on a very tight budget. Our success would mean increasing the city’s park and open space lands by 60% when there was not enough money to “care and feed” the current inventory. We saw a solution must include an organization capable of ongoing forest stewardship. Landowners were feeling “beat up” after their initial hopes were dashed, first by the original delays, then by the market crash. Landowners needed to be understood, respected and compensated. Some elected officials openly stated early efforts looked a lot like NIMBY actions (Not in my Back Yard) and were reluctant to embrace conservation that would only affect a neighborhood. Mindful now of a sense of place we focused on ways conservation might benefit the whole community. We already knew salmon depended in part upon this mile long water filter. We already knew how much carbon was being sequestered. Those arguments could fit almost any piece of land in the watershed varying only by degree of impact. They alone had not been very persuasive in the past. We needed a fresh look… and then it hit us. There are 9000 students, from Kindergarten through PhD, within walking distance of North Creek Forest. We saw an opportunity, now become mantra, that the forest might become a 64-acre outdoor laboratory to encourage science, art and literature. How myopic we had been without a sense of place and the needs of our community. What happened over the next 14 months strikes wonder among a lot of people, especially us. Our Mission became: To protect and improve the ecological function of North Creek Forest through stewardship, education and conservation in perpetuity. We put together a web site, case statement, fact sheet and printed cards. We built a portable display for public gatherings and bought a banner. We got endorsements from the Tulalip Indian Tribes, the University of Washington Bothell, the local school district, scientists, educators, artists, authors, elected leaders, students, neighbors… hundreds of them… anyone with an imagination for a perfect addition to our community and our value for the local ecology. We recruited a to-die-for Board of Directors. We built each relationship face-to-face whenever possible. FNCF sought permission to apply for grants in the city’s name. This is a far cry from demanding they do it for us. And it landed two grants only six days apart which enabled the first 35-acre purchase. We won a third grant that will enable an additional 6-acre acquisition this summer. We now have willing sellers for the remainder of the forest and are working with the city to get the final grants for this purchase. 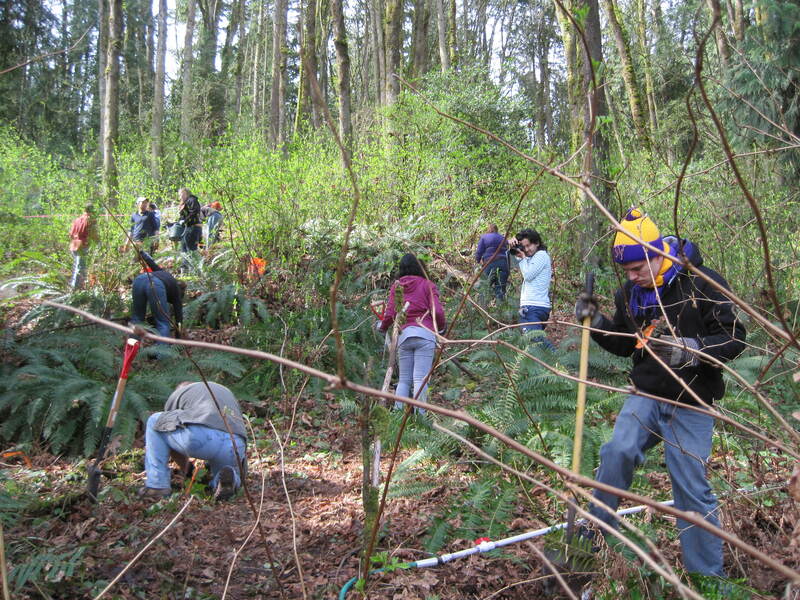 We contracted with the UW Restoration Ecology Network Capstone Project. College seniors have designed and implemented a forest recovery plan, removing invasive species and planting layers of native vegetation. Community volunteers assist them. We are also directing 3 interns from the local Community College to do a botanical survey, a UW graduate student intern in Landscape Architecture and a Work-Study student. Our model for stewardship and education is taking shape. FNCF holds house meetings (guess where we got that idea) to engage the community, listen to their ideas, present a one hour show and line up the deeper level of community commitment we need to make long term stewardship successful. We have made front page coverage across Puget Sound newspapers and even across a couple of mountain ranges, been written about in conservation publications and even had our 3 minutes of television coverage. A gigantic law firm put together our non-profit application for free. Now a big foundation called us and we have a 2-hour meeting scheduled this month. So that’s where we are at the end of 14 months. All of our work was built upon a foundation established when we spent 3-1/2 years together with NWEI courses. For me, it took that long to let go of the things beyond my reach and focus on my own community. We all had that experience, many more quickly than I. Those little suggestions at the end of each course chapter paid off. We did talk to our grocer to see where our produce came from. We did interview a local cabinetmaker who grew up in this city, and whose parents never shopped for food except flour, sugar and salt until 1960. We learned about a deep and rich opportunity to offer ourselves in service within walking distance of home. We found our place. Check www.friendsnorthcreekforest.org to see it. When you do look at the Endorsement Page. Notice the first entry. It is the Northwest Earth Institute. For obvious reasons it will always remain at the top of the list. If you want to endorse our conservation goal you can. This is a little town but it’s in a big world and you are part of it. Go forth (not far) and make a difference! 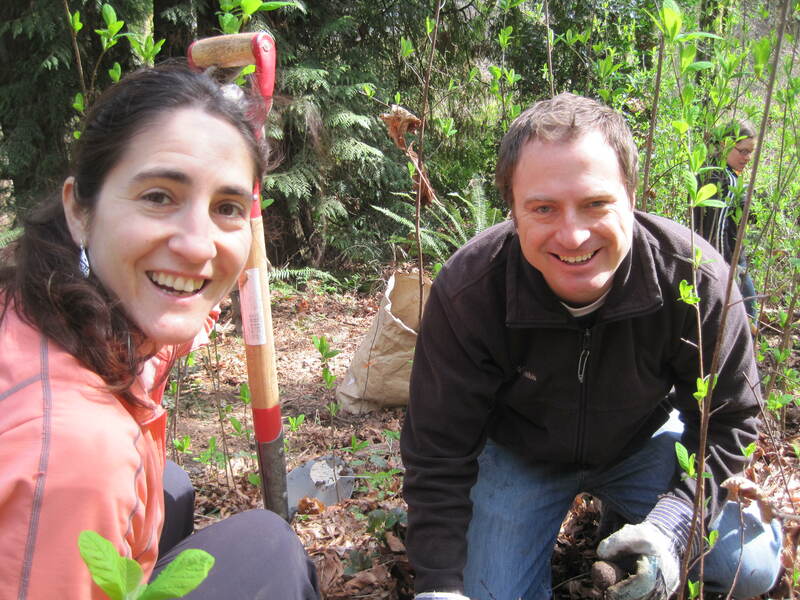 Thanks to the NWEI group that got this initiative started, and to the Friends of North Creek Forest for sharing this inspiring example of community transformation and protection of one’s place. May we all learn from your example!